The Art Newspaper's annual survey of museum attendance figures sees the Saatchi Gallery trump the national big boys for special exhibition popularity. 'The Revolution Continues' was the 28th most visited art exhibition in the world in 2009, whilst that and 'Unveiled: New Art From the Middle East' were the most visited London art exhibitions of the year. The Royal Academy's blockbuster Anish Kapoor show, the NPG's BT Portrait Prize 2009 and the Serpentine Gallery Pavilion trailed not far behind. We can't help wondering about methodology and whether the survey compares like with like. 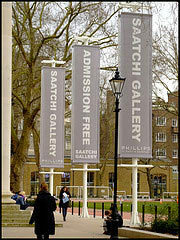 All exhibitions at Saatchi are free and an 'automatic counter' measures footfall. The nationals charge for special exhibitions, like Rothko and Byzantium, so can count ticket sales. Should we not infer that those visitors who shell out might be a better indication of popularity than those who swan in and out, gratis? Then there's the Serpentine Pavilion which is an alfresco structure with no in and out and free and open to all. How on earth did they tally up numbers apart from random sampling and guesswork? The figures were provided by the institutions and are therefore open to a degree of fluffing. For instance, when it comes to the most visited art museums, who's to say that 5 out of 10 people through the doors of the British Museum, the National Gallery or a Tate aren't just using the cafe or toilets or picking up a birthday card from the gift shop? Cynicism aside, it's great to see Whitechapel Gallery jumping into the list, following its impressive refurb. Scour the lists yourselves here and you'll note that London's most loved/hated graf artist did Bristol Municipal a few favours when he went back home for a bit. NB. We have never covered a Saatchi Gallery show. Anyone care to volunteer to rectify this?